We have not put out a montly newsletter in the last few months but are planning on get back on track with them for the rest of the year. The AGC meeting took place on 3/6/12. Dell reported (President’s report) that they have signed a lease with a new tenant for the property at 11660 Mariottsville Road so we should start seeing income flow from this property. He is still working on getting the second property leased as well. The trustees voted to waive the reading of the minutes and Tom gave a Secretary’s report. To date the AGC has sold 1544 range badges – this compares to 1172 sold by this time last year. Gordon gave the treasurer’s report and advised that any bills submitted late to the AGC for payment will be pushed back to the next month and will not be included in the prior month’s treasurer’s report. He recently received $900 worth of bills from March but since they were submitted after he sent out the treasurer’s report, those bills will appear in the April treasurer’s report. The AGC has ordered more targets and open action indicators but the prices will be increased due to increased costs from the suppliers. A discussion took place among the trustees about making a lump some payment to put toward the principal of the mortgage. Gordon reported as of now we could make a lump some payment of about $50,000 but discouraged this idea for now as we will have expenses coming up later in the year and badge sales will decrease. Gordon suggested we wail until mid year before deciding to make a lump some payment. At that point we can review our financial position and decide what, if any, extra payment to make on the principal. January’s net income was $54,000 and February’s net income was $17,564. Net assets of the AGC are currently $984,788 and the donation made by Baltimore Rifle will be applied toward the principal. Ken gave a Vice President’s report and stated the AGC has selected Offut & Roth to perform our low level audit, complete our taxes and to compile notes. The cost of this service to the AGC will be $5500. The mini-estate sale of reloading supplies which took place last month grossed about $4000. All but 20% was given back to the widow of the deceased who owned the supplies. 20% was kept by the AGC and will be donated to AGC youth programs. A voice vote was taken by the trustees and the trustees agreed to put this 20% ($678) into a fund for the AGC youth, and the RS-SOP committee will be responsible for coming up with a plan to spend the money. It was agreed that this money will be used to support juniors development for ALL clubs. IOTA Firearms Training sponsored an RSO training class. Three AGC members and several adult volunteers for the Boy Scouts took part so they can help run the range at various Boy Scout camps. The AGC members took the class so they could volunteer at the AGC to assist the current RSOs. Bryant gave his Executive Vice President’s report and stated he met with the trap committee and is developing a SOP (Standard Operating Procedure) for the trap range. This will involve who is to collect the money for trap, how the money is to be handled, etc. He finished the SOP for the FTO programs and for the mounting of plaques in Memorial Hall. The proposals were given to the trustees and reviewed. A voice vote was taken by the trustees and both proposals passed – they are now the SOPs for the trap range and Memorial Hall. Bryant also handed out a list of maintenance items which were completed in both rental properties and commented on just how much time was spent cleaning and repairing the properties. He noted that his next goal is to develop a routine maintenance schedule and budget for rental properties. John then gave a detailed legislative report with the Woollard v. Sheridan case being the highlight of the evening. Essentially the ruling meant that Maryland’s current procedure for controlling concealed carry permits is unconstitutional. However, this does not mean we can all go out and get our permits tomorrow. John explained that the Maryland Attorney General has filed for a “stay” and an appeal with the Federal Appeals court in VA (that judicial circuit also covers Maryland). If the stay is granted, then no action will be taken until the appeals court rules on the appeal. John is not certain if the Federal appeals court will uphold the ruling. If they do, that is good for all supporters of the Second Amendment. If the ruling is overturned, then we are back to square one. John noted there are two carry bills in Maryland senate committees but he hopes they stay in committees until the Federal appeals case his heard. If they come out of committee and somehow are enacted into law, they could be immediately be made obsolete by the Federal appeals court if they overturn the Woollard ruling. The Archery and Pistol committees did not make reports. The Machine Gun committee reported they are having an open house on 3/25/12 from 2:00 p.m. to 5:00 p.m. on the pistol range. Smallbore reported the juniors are still inside but are preparing to make the transition to go back outside. Both Monumental and Arlington have reported strong turnouts to their juniors practices and interest in the juniors teams is increasing. The Trap committee reported they met with Bryant and confirmed they are working on a SOP to improve money collection and to make sure there are enough volunteers. Ed Hall wanted to remind everyone he is still looking for volunteers to run trap on Wednesday, Saturday and Sunday. Anyone interested should contact Ed Hall or anyone on the Trap committee. Ed also wanted to point out that as of 2/12/12 Trap has grossed $1228 for the AGC. The Black Powder committee reported they had a meat shoot at the end of last month and had 38 participants even though the weather was cold. The High Power committee stated a work day has been scheduled for Saturday April 14th. Anyone interested in helping with maintenance on the 200 yard range needs to show up early Saturday to volunteer. The third reading of the proposed bylaws change took place at the meeting. The change was made to correct a typographical error in the original bylaws (Article 7, Section 7?). As the third reading took place a roll call vote was taken and the proposal passed unanimously. Both IOTA and Mid Atlantic Firearms Training held Utah concealed carry classes at the AGC. They had about 67 people in the class and to show support to the AGC, both FTOs donated $590 (combined) to the AGC to be put toward the mortgage. Under New Business Tom D’Asto brought up a 4-H fundraiser is set to take place on Saturday, March 31st. The money will be used to help send the top four 4-H Maryland shooters to the national match scheduled to take place in Nebraska. There are six kids from Maryland scheduled to participate in the match but only four will be selected. The trustees voted to approve a donation of $300 to the Maryland 4-H as part of their fundraising efforts. An AGC member requested a special exemption to shoot black powder rifles on the pistol range as part of his club’s event. It was discussed among the trustees and the exemption was approved by voice vote. Maryland RIfle wanted to propose that the FTOs limit their range space to two lanes on the 200 yard range given the small size of the range (only ten lanes). It was discussed among the trustees but Ken explained that the FTOs typically do not use more than two lanes at a time as the approved ratio of instructor to student is 1 to 2. The motion was eventually withdrawn and there was no further discussion. The last order of business was a proposed raffle. Mike Pinkine of Glenmore made a motion to spend approximately $5600 of AGC money to purchase four new rifles as prizes for a raffle. There was discussion among the trustees and a voice vote was taken. The motion failed. Our events have been well-attended so far this year even given the cold weather. Our most recent event was a Bust Fest this past Sunday which had a total of about thirty participants. The next event is a Frame Build scheduled for this Sunday, March 18th. This will not start at 9:00 a.m. but rather 10:30 a.m. due to a schedule conflict. The next shoot is a 100 yard shoot on Saturday, 3/24. I also want to remind everyone that we have a club meeting this Wednesday, March 14th. Please keep in mind we will be taking part in public trap before meeting. Glenmore is having a club shoot and they have invited Arlington to shoot “protection” during public trap. Bring your shotguns Wednesday and show up early. 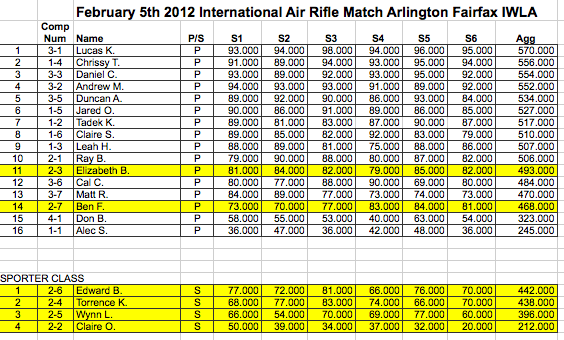 Congratulations to ArlingtonRPC member participants in the Northern Virginia (NOVA) Sharpshooters Match on February 5th. Members participated in Precision and Sporter classes.